Steve I am extremely grateful to you for all that you share with us. Was Black Peter an American bred dog? I believe he was out of Holland, if memory serves me right! Lion needed a bit more length and angulation. He was a fine looking mastiff! Lougest Black Peter has brought many fond memories back for many of us. Lion was wonderful--thanks Gregory-- I needed a smile, and between you and Angie --you gave it to me. Steve what can any of us say? We are lucky and fortunate you are here and give up so much of your time and energy getting the pictures and posting them. It is worth it --Look at your count on this thread--it is a whooper! if its of interest, your photo dated 1846 has brown spots. If you don't have it treated by an conservationist it will continue to deteroriate. The "brown spots" are a type of mold that sets in on old photos, etchings, photogravures, etc. A conservationist will probably charge about $35.00 to stop the further growth of the mold...to completely remove it is more costly. Thank you for sharing your collection with us. It's called foxing and I'm well aware of the conditions and solutions. I'm in the business of 19th & 20th century American Art and deal with these issues daily! I am curious. Which 19th and 20th artists? Again, just curious.. If you're the seller it's called foxing. If you're the buyer its called mold. My curiosity got the best of me...thats quite a list. Steve have you seen Robert Henri's Bride painting? I can't recall the title. I used to live at Cozad NE that has a Robert Henri museum, soon after it opened Kearney NE hosted a Henri exhibit with that painting included. She and the painting are larger than life size and it is very eerie, the impression of a spirit watching you instead of you viewing a painting. Steve thank you so much--isn't she beautiful but haunting. The lighting in the gallery when I saw her was very dim but there was a stream of light coming through a window that lit her face and the eyes just glowed. I served on the Cozad Arts Council for about six months right before a divorce and move from the city. Cozad was just in the process of opening the Henri Museum and it was completely empty when I toured the building. It is in an old house that was refurbished for the museum. If I remember right Henri's father stood trial for shooting a man. Thanks again for her picture--where is she hanging today? PS: Thanks for posting the 1905 post card of momma and puppies-so nice. I need to get my new baby and 18 month old posted-both apricots!!! What a beautiful picture of Wallon - thank you!! Great picture!....sometimes when I'm driving home on a highway with my dog and my banjo in the car I think there's really nothing else I need in life and no reason to go home I guess I've still got some rambling blood running through my veins. Big time change. That Bull Mastiff looks more like a mastiff. 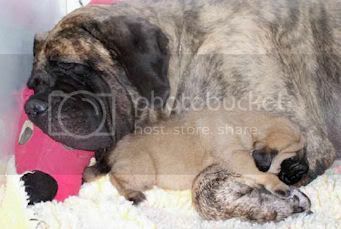 Many of the early mastiffs looked like early bullmastiffs and vice versa, with good reason! Most of those mastiffs were of bullmastiff origin. It's been my personal belief, based on all that I've read over the last 30+ years, that the mastiff is in fact a version of the bullmastiff! Over time, the fancy and standards have separated the two breeds to form a more definitive difference in type, but the progenitors of both breeds were from shared crosses of similar breeds and diluted genetic equivalents. Steve, I can not see any spots. Is it an old picture? Steve that one is kind of creepy. I'm sure glad we have our mastiff of today. So Steve, do you think saints could be more mastiff than mastiffs? The Saint was influenced by the mastiff and in turn, the mastiff was influenced by the Saint. A quid pro quo! All records were destroyed at the Hospice in 1555, so the actual recorded animals used to produce the Saint were lost. We can only use anecdotal references, passed down from generation to generation, but the mastiff influence in the Saint cannot be denied! Steve - I LOVE these pictures!